Ahh, it’s that time of year when school has just started, summer weather is lingering and everything starts to turn pumpkin on us. While I cannot WAIT for fall and I’m getting some great pumpkin recipes going on in my head, I’m not there quiiiite yet. But I DO have a squash recipe to hold you over until all things go orange on us. We do in fact eat spaghetti squash year around over here but I love how plentiful they are in the fall. And I’ll venture to say that we eat it at least twice a week when fall rolls around. This week I’ve been hosting the Whole30 Recipes account over on Instagram. I’m talking all things kids and including lots of easy kid-approved Whole30 recipes for everyone. While I’ve never had my kids do a round, my kids always eat what we eat. So when I do a Whole30, my kids are eating the same thing that I am for dinner. I’m not into making more than one meal for dinner. Mostly because I think it’s important the children learn to eat healthy, try new things and appreciate how much healthy and delicious food they have. But also, because I’m lazy. No way I’m cooking them something different after I poured my heart out making something delicious and healthy in the first place to zap some chicken nugs in the microwave. I ain’t nobody’s fool! 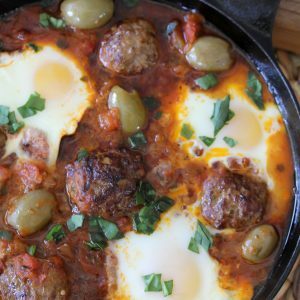 Anyhoo, I added this recipe to the feed and it was a hit so I wanted to add it to my blog as well for you. It’s super easy to make and takes minimal effort. The most time consuming part is just making the meatballs up and even that isn’t much. A couple of notes… I like to make mine in individual ramekins but you can also serve it in a traditional baking dish and scoop it out. Just add a few more minutes to your cooking time. As well, depending on your spaghetti squash and tomatoes additional liquid may be released when it cooks. Sometimes it happens and sometimes it doesn’t. If it does, I just use a turkey baster to get some of the additional liquid out at the end. It’s a minimal amount but I’m totally OCD in the kitchen. And finally if you’re down with dairy add some organic mozzarella for an extra treat. Just know the recipe will NOT be Whole30 compliant at that point. 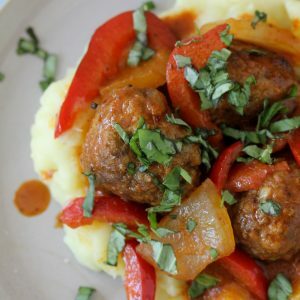 And if you’re REALLY down with meatballs, check out my Mango + Jalapeño Chicken Meatballs. It’s one of the top 3 most loved recipes on this blog and is sure not to disappoint! I wish I had more to say about this but it’s a pretty straightforward recipe kids and grown-ups will love. When you make it let me know what you thought! Or post it to IG and tag me and don’t forget to hover over the image and Pin it for later! A paleo casserole that combines two favorites, spaghetti and meatballs. Grain free, gluten free and dairy free! 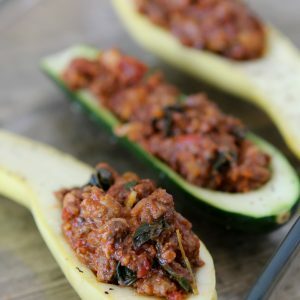 I pulled this recipe off of Instagram and loved it! I have made it many times to everyone’s liking. A winner! Next time I think I’ll throw some chopped kale or spinach in. Thanks! What size “can” of tomato sauce? Not all of us have access to Trader Joe’s (don’t they carry different size cans of tomato sauce?). Also I don’t have any idea what 21 Salute seasoning is-can you offer an alternative? A standard can of tomato sauce is 14-15 ounces, that will work! And and sort of your favorite savory seasoning mix will work. Don’t be afraid to experiment and mix it up! 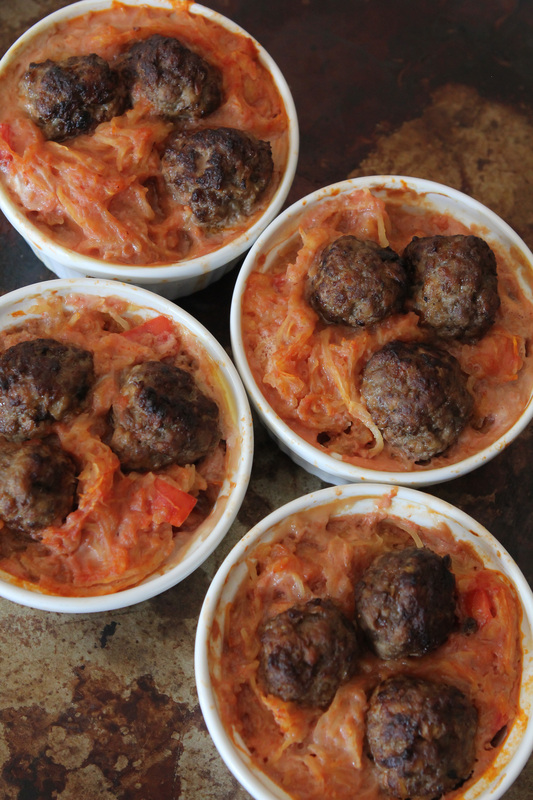 I have this in the oven now and I just realized, I added the tomato sauce, eggs, and tomatoes to my spaghetti squash and pushed the meatballs down into the mixture……was I supposed to add any spices to the tomato sauce?? I am worried it is going to taste very, very plain. Doesn’t tomato sauce need some sort of seasoning, like basil or something? Nope, it should come out just fine. How did you like it? You can always add other spices if you prefer. Feel free to tinker. This is one of our favorite recipes! 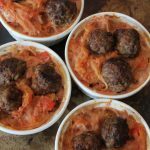 Although I find it makes SO MANY meatballs I can never fit them all in lol – but I do cook it as one big casserole in a baking dish instead of as minis, so maybe that’s the difference. So satisfying and even my 2 year old loooooooooves it!! !